I have also looked at other work on SimScale regarding the Ahmed body by @jousefm and the nice simulation by @sjoshi. 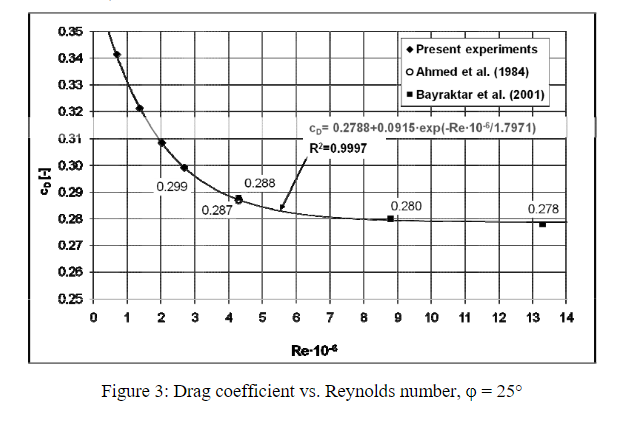 According to the Project Spotlight on the Ahmed Body (Ahmed Body), the drag coefficient was calculated at 0.280 (about 2% error to experiment). When I pull the data results into Paraview though I calculate a Pressure Drag of 0.352 without including the additional Viscous Drag. Something seems off with all of these results as this should be a fairly simple project overall but the results are not matching with my expectations. Can anyone give me some advice on what I may be doing wrong? As you mentioned you neglect viscous forces in your calculations which the platform takes this into account. Wall shear stress can be added as a Result Control item in the workbench. This will calculate the drag component due to viscous forces. If you still have issues with the result feel free to share your calculation inside of Paraview with us to see what you have done. @jousefm, I calculated the drag coefficient in Paraview using the steps you laid out in the following article: Aerodynamics Post-Processing with SimScale and ParaView. After calculating the drag force with the pressure and the normals, I converted this to a drag coefficient using Cd = 2F/(rhoA*V^2). Since the simulation by @sjoshi was a symmetric domain the A=0.056m^2 and his specified values for rho (1kg/m^2) and V (40m/s). I don’t see how adding in the viscous forces will help the situation. The paper by Ahmed et al. is the total drag coefficient (Cp + Cv) and the drag coefficient I am calculating with just the pressure is already much too high. In addition, I copied the solver settings and important mesh settings from his original simulation and came up with a 0.402 Cd which includes the viscous forces. Again, I feel like something is missing overall. I will surely look at the problem in evening. By the way just check the reynolds number at which the other authors are calculating the coeff. of drag, coz its going to change by a large amount with reynolds number. Your reynolds number is around 8.16* 10^6(at 60m/s). For the work I am interested in creating, a 40M cell grid per body is just not feasible, but a 4M cell grid is. In addition, I believe it would be a great addition to the community to have an Ahmed type reference study that is small enough that the Community Users can run without using a large chunk of their free core hours. This will encourage them to explore additional projects and possibly expand on the calculations. Hi @LWhitson2, I cant comment much on the accuracy of the other projects, unhelpfully, the force coefficients were not added so it makes it more time consuming to check however, I think I might be able to help a bit with your own project and I agree, if we could have a more comprehensive validation project that would be amazing. Firstly, when I looked at your project, the only simulation setup for me to look at was the first one. When we look at drag, the boundary layer plays a large part, so ensuring that boundary layer modelling is correct is very important. Therefore, I looked at your mesh to see your layer setting and couldn’t see a layer inflation refinement present, so that would be a good start. Particularly about the divergence scheme for velocity and the y+. Mesh size or number of cells is not a direct one to one comparison for mesh quality. There are a multitude of things to consider that comes into mesh quality. It is very likely that the grids on the papers have been very well generated with very tight control and are well optimized. It is totally possible to do this on SimScale and with snappyhexmesh but you will need ALOT of time to fine tune all the parameters to get the quality you need while optimizing the number of cells. As Darren has mentioned, y+ is also a big part of it and it contributes greatly to your mesh count/quality. Alot more work needs to be done on the meshing end.